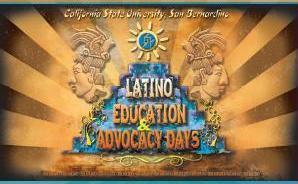 The fifth annual Latino Education and Advocacy Days summit will be held at Cal State San Bernardino on Thursday, March 27. This year’s honorary chair, or Padrino de Honor, will be civil rights activist Julian Nava, the first Mexican American to serve as U.S. ambassador to Mexico. Nava was a civil rights activist during the height of the Chicano Movement, and he was the first Mexican American to be elected to the school board of the Los Angeles Unified School District in 1967. Nava joins a distinguished group of LEAD honorary chairs. Previous honorees were civil rights and education activist Sylvia Mendez, philanthropist Judy Rodriguez Watson, CSUSB dean emeritus Ernie Garcia and San Bernardino County Supervisor Josie Gonzales. Journalists and activists Graciano and Trini Gomez were honored at the inaugural LEAD “Feria Educativa” held in October 2011. The day-long free conference will be held in the university’s Santos Manuel Student Union Events Center and will be hosted again by CSUSB’s College of Education. Online registration is available at the LEAD website, http://leadsummit.csusb.edu/. It also will be webcast simultaneously to viewing locations nationally and internationally. Nava is one of eight children born to Mexican immigrant parents in Los Angeles. He grew up in the barrio of East Los Angeles. In 1945, he volunteered for the Navy Air Corps. Upon returning to Los Angeles, he studied at East Los Angeles Community College before transferring to Pomona College. After earning a bachelor’s degree in history, Nava earned a doctorate in Latin American history from Harvard College in 1955. He taught in Venezuela, Spain and Puerto Rico. After teaching in Spain, he founded Centro de Estudios Universitarios in Bogota, Colombia. From 1957 to 2000, he was a professor of history at Cal State Northridge. In 1967, the Congress of Mexican American Unity, a group of 92 community groups, nominated him to run for the Los Angeles Unified School District and he became the first Mexican American to serve on the board, which is comprised of 13 cities, including Los Angeles. In 1980, President Jimmy Carter appointed Nava as U.S. Ambassador to Mexico, making him the first Mexican-American to hold that position. In 1992, he ran for mayor of Los Angeles. In 1993, Nava was a pallbearer for the funeral of legendary labor leader Cesar Chavez. Nava worked with Chavez since his time with the Community Service Organization in Los Angeles after World War II. Nava was portrayed by actor/director Edward James Olmos in the HBO film “Walkout.” He also spent time behind the camera serving as producer of a series of one-hour documentaries that included the history of Spain’s Basque people in “Song of the Basque.” He also produced and co-directed “Voices of Cuba” with producer, teacher and puppeteer Todd Mattox, and produced a documentary – “Zacatecanos de ida y vuelta,” (Roundtrip Zacatecanos) – on cross-border migration to and from the United States in two languages. Now retired, Nava is a professor emeritus at Cal State Northridge and lives in San Diego with his wife, Patricia. He lectures widely about multicultural education and serves on the board of directors of Encuentros, which promotes education among young Hispanic males. In 2011, a new middle school, the Dr. Julian Nava Learning Academy in Los Angeles, was named for him. The LEAD 2014 summit will be webcast live courtesy of LatinoGraduate.net to more than 1,500 viewing sites in the United States and in 32 countries, including Mexico, Argentina, Belize, Brazil, Chile, Colombia, Costa Rica, Cuba, El Salvador, England, Guatemala, Iceland, Jamaica, Nicaragua, Panama, Spain and South Korea. Sites that will offer town hall viewing events include the Mary Lou Fulton Teachers College at Arizona State University, the College of Education at Washington State University-Pullman, the ESCUELA (Empowered Students at Colleges and Universities United for Education, Leadership, and Access) consortium coordinated by SUNY at Buffalo, with community-based organizations Hispanics United of Buffalo and the Belle Center, uniting all the eight colleges and universities in their local region. To date, the event has attracted more than 160 sponsors and partners, including Cardenas Markets, KCAA Talk Radio, Time Warner Cable, San Bernardino Community College District, the California Teachers Association, H&R Block, the Roman Catholic Diocese of San Bernardino, Kaiser-Riverside and Altura Credit Union. During the conference’s lunch hour, the LEAD Summit will feature a dynamic free concert celebrating diverse and beautiful music of Latin American origin. The “Mosaico Festival” concert will feature folklorico dancers, storytelling, soloists, and even the opportunity to sing along to a tune or two. The concert, which also will be webcast, is courtesy of the San Bernardino Symphony and the support of the James Irvine Foundation’s Exploring Engagement grant initiative, the Coussoulis Arena, and Jim Watson and Judy Rodriguez Watson of Watson & Associates. For more information and to register online for the conference, visit the LEAD website at http://leadsummit.csusb.edu/ or contact Enrique Murillo Jr. at (909) 537-5632. For more information about Cal State San Bernardino, contact the university’s Office of Public Affairs at (909) 537-5007. Visit its news website at news.csusb.edu.